It is July. And it is HOT. Valley Hot. Sitting at my desk, while the sun burns through the windows, has been a little bit miserable. Happy to be so busy, miserable to be so hot in my bright white office. So, popsicles. Cold, and satisfying and super healthy, because it’s just juice! My lovely friend Megan posted a juice recipe a while back that is so perfect. It’s sweet and so full of flavor, and I always sneak in a little bit when I’m juicing the kale and other boring healthy greens. I juiced a bit and then added some solids to the blender so they wouldn’t freeze too hard (although, I guess if you like a solid hard-as-a-rock popsicle, you could skip the solids and just freeze the juice.) So delicious, so perfect to get through that 5:00 hour when I really want to quit, because the sun is burning through my retinas, but I must keep going. Enjoy! Put the apples, 1/3of the pineapple and 2 sprigs of mint into the juicer and juice. Transfer the juice to a blender, adding the remaining 1/3 of pineapple and the leaves from 2 sprigs of mint. Blend. 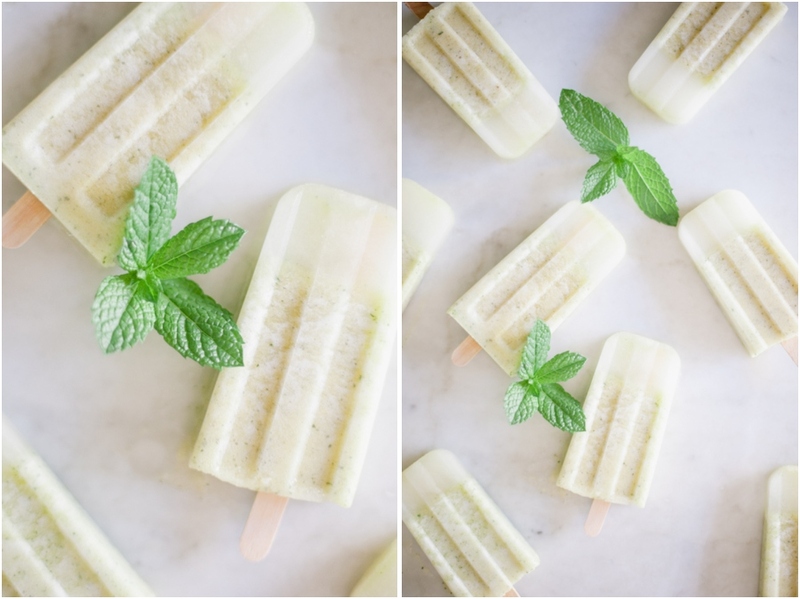 Pour mixture into popsicle molds and put in the freezer until frozen. Enjoy! Honestly, I think you could switch up this recipe any way which way you wanted… more pineapple, more apple or more mint. It seems to work really well in whichever combination you desire!